In 1999, Klaus Lackner from Columbia University, US, first suggested1 that carbon dioxide could be captured straight out of the air to help tackle global warming. Nearly two decades later, companies are hoping to make direct air capture (DAC) a commercial success. But while there is an environmental case for DAC, the economic case is much weaker. Although the CO2 it produces would be a saleable commodity, a pro-DAC study published in 2011 by the American Physical Society3 concluded that CO2 from DAC would cost at least $600 per tonne. That is nearly triple the going market rate for small quantities. Yet a Swiss startup called Climeworks thinks it can turn the corner on DAC economics, and aims to prove it with its new plant 30km southeast of Zurich. Since going onstream in early June, the 900tonne/year DAC plant has already cracked the $600 barrier says Valentin Gutknecht, Climeworks’s head of business development. At this price, it is competitive in remote locations, where CO2 for carbonated drinks and greenhouses must be trucked over long distances. Unlike industrial sources of carbon dioxide, air is everywhere, so a DAC plant can be built almost anywhere. The plant extracts ambient CO2 by blowing air across filters charged with an amine sorbent. After about two hours, the filters are saturated, and the CO2 is desorbed by heating. Climeworks’s competitiveness rests on its ability to use low-grade exhaust heat of around 100°C for this process. Gutknecht points out this is widely available and cheap – in Climeworks’s case, it comes from a neighbouring municipal-waste incinerator – and accounts for about 80% of the process energy. Most of the rest is consumed in driving the intake fans. The company says it aims over time to slash its energy consumption, currently reported at 3MWh per tonne of product. Climeworks’s founder and board director Christoph Gebald expects to cut costs over the next 3–5 years by a factor of three, through process improvements and economies of scale, which would put its CO2 squarely into commercially viable territory. 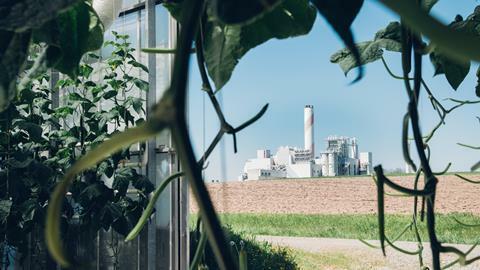 The Climeworks plant sells its CO2 directly to a vegetable greenhouse just 400m away, but other groups are pursuing plans to convert ambient CO2 into more valuable liquid fuel. The SOLETAIR project is a research consortium of Finnish and German academics funded at €1 million by their respective governments. It uses a similar DAC process to that of Climeworks, says Pekka Simell, principal scientist at Finland’s VTT Research Centre. It is also modular and compact: the current pilot plant also debuted in June and can fit inside a 40m3 ISO shipping container. The captured CO2 then reacts with hydrogen from water electrolysis, eventually being converted into gasoline, diesel and kerosene via a Fischer–Tropsch style synthesis developed at the Karlsruhe Institute of Technology in Germany. First results, Simell says, will be published in mid-November, though he declined to discuss the current costs of production. Carbon Engineering is a venture-capital-funded firm chasing air-to-fuel conversion on Canada’s west coast. Since 2015 it has been running a 1 tonne/day demonstration plant. Its DAC process is similar to flue-gas scrubbers, starting with a hydroxide wash to capture carbon dioxide and convert it into carbonate. The second step precipitates calcium carbonate from the wash, which is further calcined into CO2 and calcium oxide (the latter returned to the precipitator). It plans to bring electrolysis and fuel synthesis units onstream in late 2017. Carbon Engineering says it aims to operate multiple air-to-fuel plants of 2,000-barrel per day capacity by the early 2020s. Just to follow up on my previous comment, in fact Switzerland emits very little CO2 in its energy generation as most of its electricity comes from hydropower: https://en.wikipedia.org/wiki/Electricity_sector_in_Switzerland#Carbon_dioxide_emissions So it's a great place to do this air capture work! Hmm, according to my reckoning, the UK's emissions from energy generation in 2015 were 400g CO2eq/kWh. On that basis the 3MWh per tonne of CO2 captured from the air that Climeworks uses would emit 1.2 tonnes of CO2! I guess the emissions from generation in Switzerland might be lower, but I'd be surprised.